Ready for your next provider meeting? If I had a dollar for every person who enlightened me with the news that Global Business Services (GBS) is BS, I could purchase about three hours of offshore help desk support. However, while several folks make valid arguments why GBS may be a pipe-dream for their own organizations (or some of their clients' organizations), I believe they are missing the big picture. The crux of the matter is that when it comes to achieving business outcomes, enterprises need to focus on the "what", but can't do that until they have some capability with the "how". Many of the GBS cynics are stuck in a world where they will forever be trying to master the "how" and settling for achieving the modest benefits of some labor arbitrage savings and process standardization. Simply put, today's ambitious enterprises can't really focus on achieving their desired outcomes (the "what") until they have the operations framework in place that gives them the control and culture to make genuine advances with their operations performance (the "how"). In short, there are limitations to the value you can achieve by finding a few more bodies that can be displaced to lower-cost locations and standardizing processes with some better workflows and technology. Most ambitious governance executives already know that only focusing on transactional processing and lower costs will fail to reap the long-term, continuous incremental results their leadership demands (or will start to demand when they see the results of peer enterprises). In short, there is a ceiling to achieving outcomes if you can't make the Six Leaps. 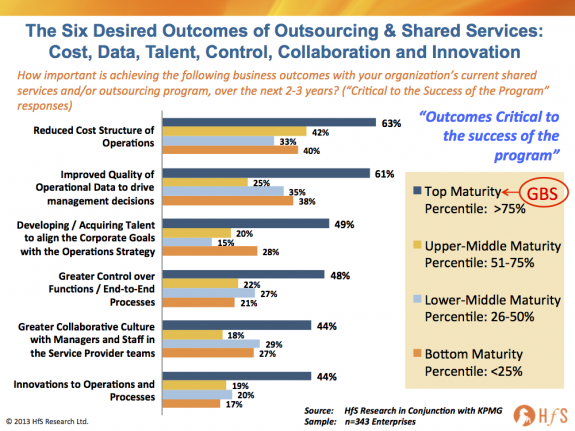 As the data clearly illustrates, the desired business outcomes of enterprises' shared services and outsourcing initiatives are pretty much the same as their operations become more mature. However, there is a clear jump in focus as enterprises approach the top quartile for maturity - which represents those enterprises which most closely fit the GBS framework. Suddenly, the desire to drive out cost, improve their quality of data is critical to more than 60% of enterprises, as opposed to much lower proportions of less mature enterprises. 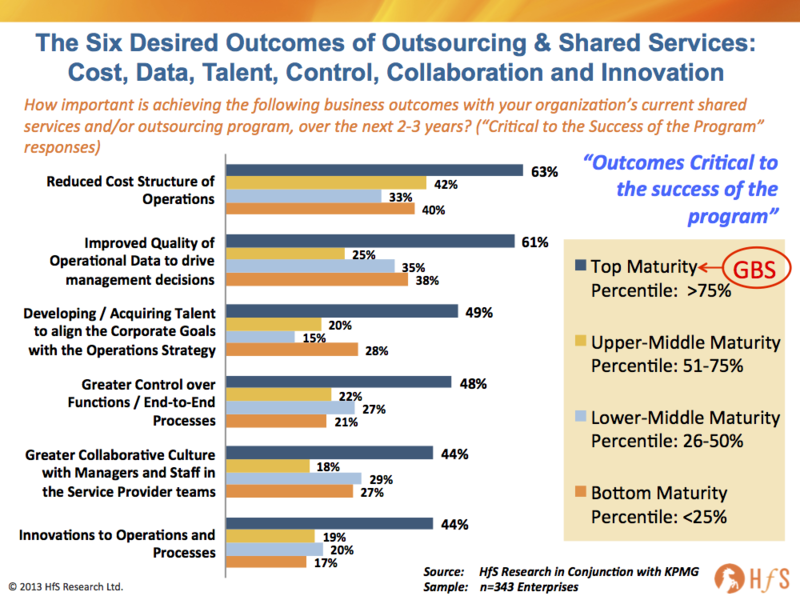 Similarly, in terms of developing talent, increasing control over end-to-end processes, improving collaboration with service provider staff and achieving innovations to to processes, the impetuses are double that of the less mature enterprises across each category. 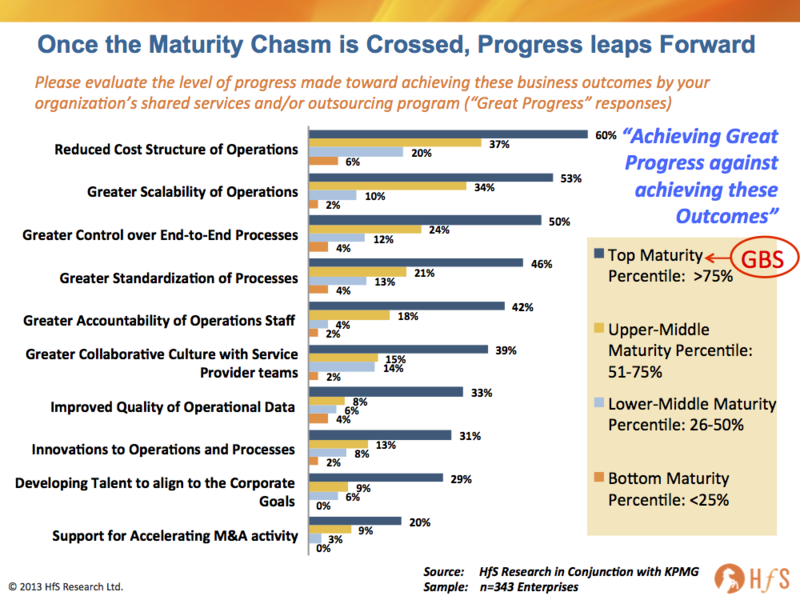 As the data plainly points out, strong performance against outcomes increases markedly with maturity levels of operations. 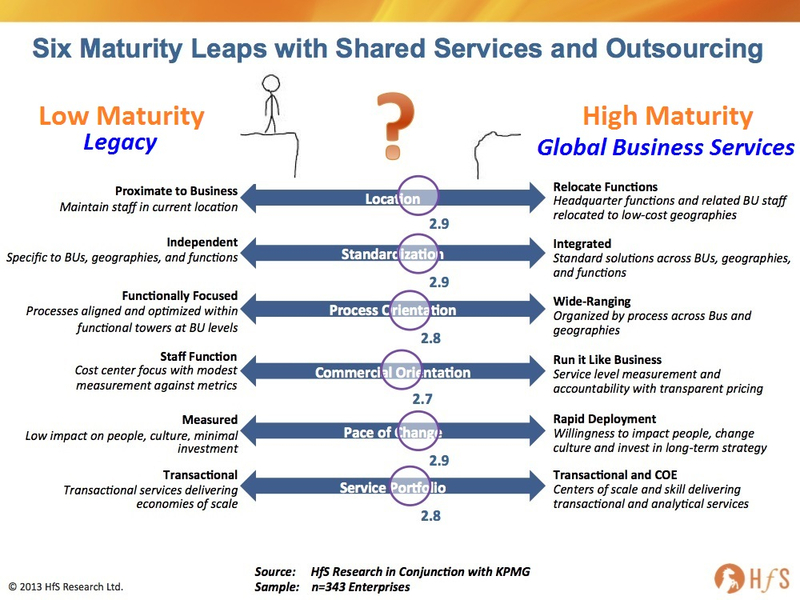 However, what is also apparent is there is a real "leap" forward when enterprises enter the highest quartile for maturity. It's as if they took a running jump and now they are on the other side of the chasm, they have hit the ground running. Why do I dismiss the GBS naysayers? Because even in the relatively "tactical" areas of cost reduction, capability and standardization, the top quartile massively outperforms. However, the gaps in performance are even more pronounced between the top quartile and the rest of the pack when it comes to more strategic measures, such as staff accountability, greater provider collaboration, improved data quality, talent alignment with corporate objectives and innovation. One of the problems with GBS is that too many people simply don't understand it, and many who do are threatened by it. It's about closing the book on the legacy practices of managing providers with punitive and contractual measures, on persisting with dysfunctional, poor quality shared services, on tolerating siloed uncollaborative business units. 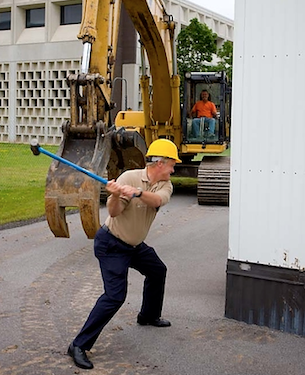 Asking a monolithic vendor manager to jump on the GBS bandwagon is akin to asking a demolition expert to start building houses. Suddenly they need to think about producing an end product from their work that has long-term meaning and value to their clients, as opposed to meeting simple targets devoid of a long term game-plan. It's about the governance function becoming the consultative, value-add capability that does the basics really well, such as running transactional processes efficiently at low cost, but also contributing the higher-value services the organization needs, namely providing better quality operational data, continuous improvements to processes and operations, getting the best out of the third party outsourcers, and so on. 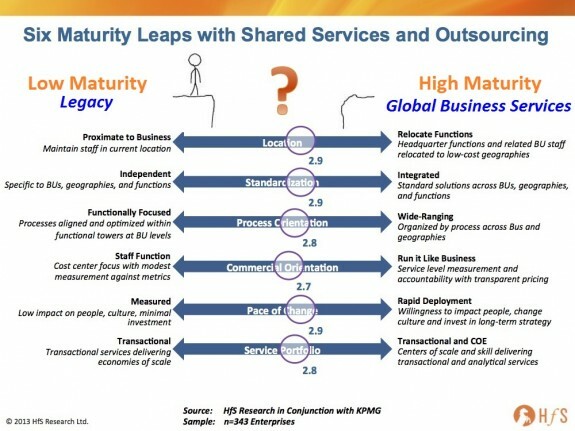 If you're stuck in those lower two quartiles for maturity, how long will it be before your leadership decides to eliminate much of your inhouse operations altogether? I would agree that GBS is BS to many organizations which couldn't even conceive of achieving anything near the performance levels of the high achievers with their current operational leadership and infrastructure. In some cases, they may be better off outsourcing as much as they can now, and then rebuilding their internal competencies with a new governance team that can apply analytical thinking and real value to their organization. Or they may simply not care and will limp along hauling around a hulking great inefficient back office, if they can somehow get away with it and still survive. Readers can also access our complimentary new report, “The Global Business Services Industry Study“, produced in conjunction with KPMG LLP, where we interviewed 416 enterprises across a cross section of regions and industries about their GBS activities, priorities, drivers, constraints, and plans. "Asking a monolithic vendor manager to jump on the GBS bandwagon is akin to asking a demolition expert to start building houses"
That's the quote of the year, Phil! Excellent analysis. What struck me as unique here is the fact that the focus on outcomes really picks up with the GBS organizations. It seems that the more companies invest in a mature operations model, the more they can align the business goals with the operations strategy.